The reboot “boom” is headed towards a crash but original scripts aren’t going anywhere anytime soon. As Hollywood sinks its teeth into the early weeks of the 2017 summer box-office barrage, they do so with some apprehension. Insiders in the industry predict that this summer’s ticket sales (bookending around Labor Day) could be the lowest it’s been in a decade. This shouldn’t come as a surprise to many. Looking back, and then ahead, 2017 is filled with instalments to franchises that have existed for decades. In April, we saw the release of the eighth Fast and the Furious movie, which claimed to be the final title in the series but only time will tell. With nothing but adaptations and sequels taking center stage and garnering less than years past, it seems that trusted franchises, once capable of driving people to the theatre, may beginning to go a bit stale. Films like Wonder Woman and Guardians of the Galaxy Vol. 2 may be doing their part to keep things afloat, but 2017’s biggest success isn’t derived from a comic book or a dusty franchise in need of revival. This year’s biggest success has been Get Out, a movie that—while rooted in familiar themes—is completely original. No, Get Out isn’t the highest grossing film of the year—it’s not even in the top 10. But its success is the way it revitalized the movie-going experience. That, and the $250 million it made against its less than $5 million budget. Jordan Peele’s directorial debut is a horror film unlike anything else and its originality has brought back the excitement of returning to the movies. It’s topical, appeals to a large audience, and most importantly, it shows that original scripts are not only worthwhile, but also incredibly valuable to studios that need to add more variety to their docket. Though Get Out has been an original box office hit, it hasn’t been the first signal for change—there are other signs that something’s got to give. Netflix (flourishing by way of awesome television shows that aren’t found on the actual television) has been dipping their toes into producing original movies for a few years now. While everyone can go for an annual binge of The Office, it’s this fresh content that keep subscribers loyal to the service. Okja—a Korean film about keeping a hippo-pig from the slaughterhouse—is coming to Netflix next month, and it’s already been making waves in the industry. Before that was War Machine with Brad Pitt in the lead role, finally making his way onto the biggest screen of all–the one in everyone’s pocket. Plus, just take a look at what’s next: Will Smith playing a cop that teams up with an orc, Bad Boys style. Originality—it’s out there, just not in theatres. For a long time, the average moviegoer, someone that’s only going to the theatres a few times a year, relied heavily on familiarity. Instead of having to invest in a new universe, characters they’ve never met, it was safer for them to revisit a place they’ve been before. This concept gave birth to the outdated risk that Hollywood still so desperately wants to avoid: new, unfamiliar stories. This mindset was understandable for a long time, even relatable, but the times have changed. What’s a “movie-goer” when you can just watch what you want on your laptop? With the way media is now consumed out of theatres, there’s a definitive need to change the way it’s relayed in theatres. Or at least what’s relayed in theatres. This is even truer when people are growing sick of the familiar, as sales will show. Really, how many people are that excited by a fifth Transformers movie? What people are excited for is a chance to discuss something that’s outside of the norm with the people in their life, films that gain prestige by being unlike everything else on the marquee. It’s one of the reasons Get Out was so successful; it defied social norms, as well as everything that was out at the time. It may have taken too long, but change in Hollywood is arriving. Don’t get me wrong; blockbusters (like whatever’s next for Planet of the Apes) aren’t going anywhere. But taking a look back into last few years’ successes, films based on original scripts are more lauded than ever before. 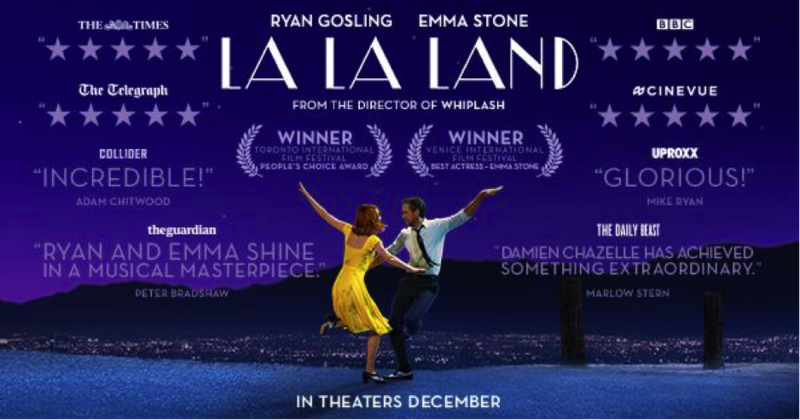 La La Land, the almost Best Picture of the Year turned $30 million into nearly $450 million. The Witch was a horror film for the ages and in grossed $40 million in 2016 against its budget of only $3 million. Both of these movies are the ones people are talking about, not whichever villain most recently tried to take down the inevitably victorious Captain America. The summer box-office sales bring in roughly 40% of annual ticket sales for studios. With ever-diminishing returns, it’s apparent that studios can’t float on franchises much longer. Like I said, blockbusters aren’t going anywhere, but originality never left. Original scripts are soon to be more sought after than any continuation of Jack Sparrow’s soggy story. As online streaming services swoop up any invigorating story that guarantees raised eyebrows, it’s only a short matter of time before the rest of the industry finally does the same.